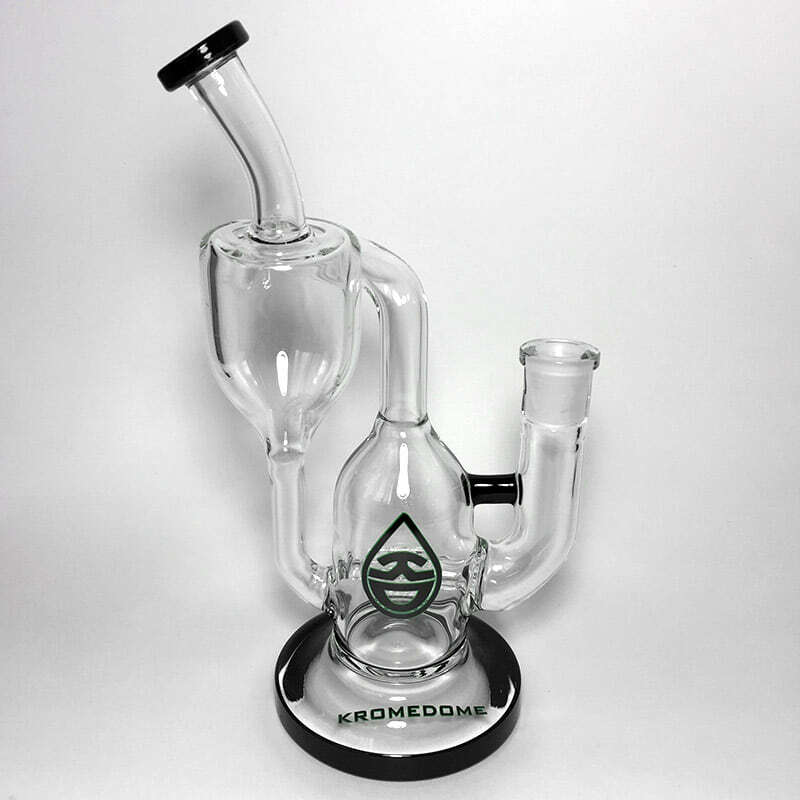 KromeDome offers killer, electronic dab rig setups at excellent prices. The KromeDome e-Nail bundle includes a recycling water pipe and an electronic nail (aka e-Nail). Dabbing with an e-Nail is quite a delightful experience. 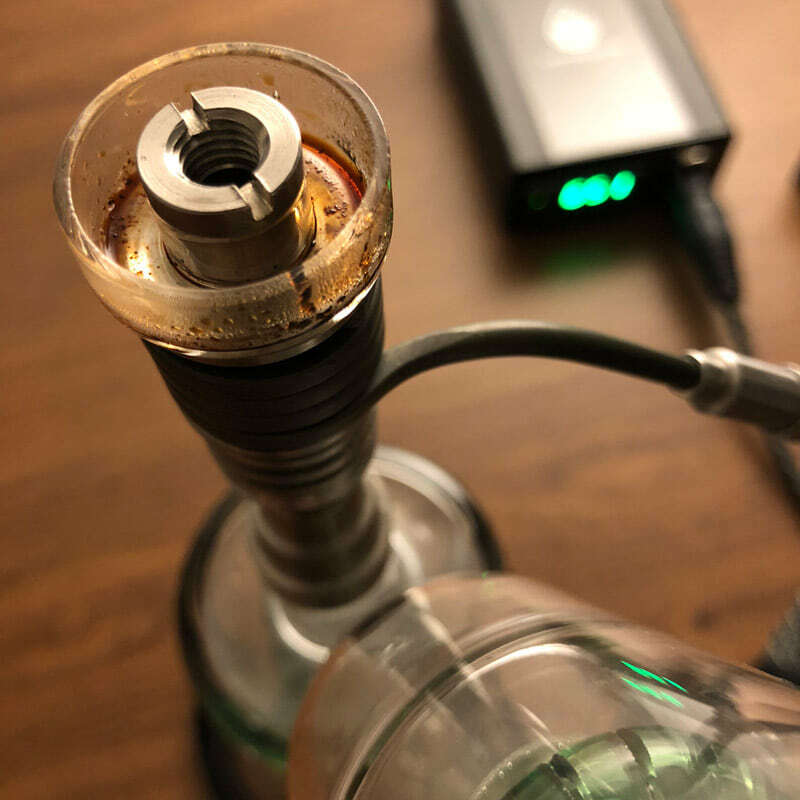 Because the nail is heated by a digital controller, you can ditch the sketchy torch and dial in your desired temperature for perfect dabs every time. If you’re not familiar with dabbing, it’s a huge part of the growing cannabis culture. 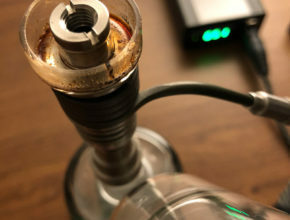 Dabbing usually involves the use of a water pipe (similar to a traditional bong) and the use of a nail (instead of a bowl piece). Dabbing is an efficient way to vape because it allows you to intake a tiny, concentrated dose of cannabis as a dab of wax or other cannabis extract. Dabs are instantly vaporized as smooth, potent hits. There’s no combustion involved so you can avoid burning plant material and irritating smoke. 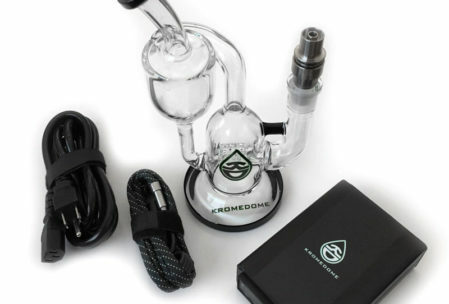 We received a sample KromeDome bundle which normally includes one glass water pipe and one Lantern digital e-nail kit. 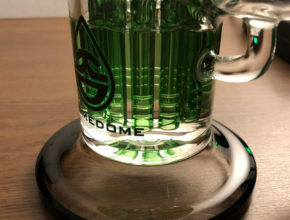 However, we were fortunate to receive two glass pieces to test out including the KromeDome Cyclone and KromeDome Microscope water pipes. 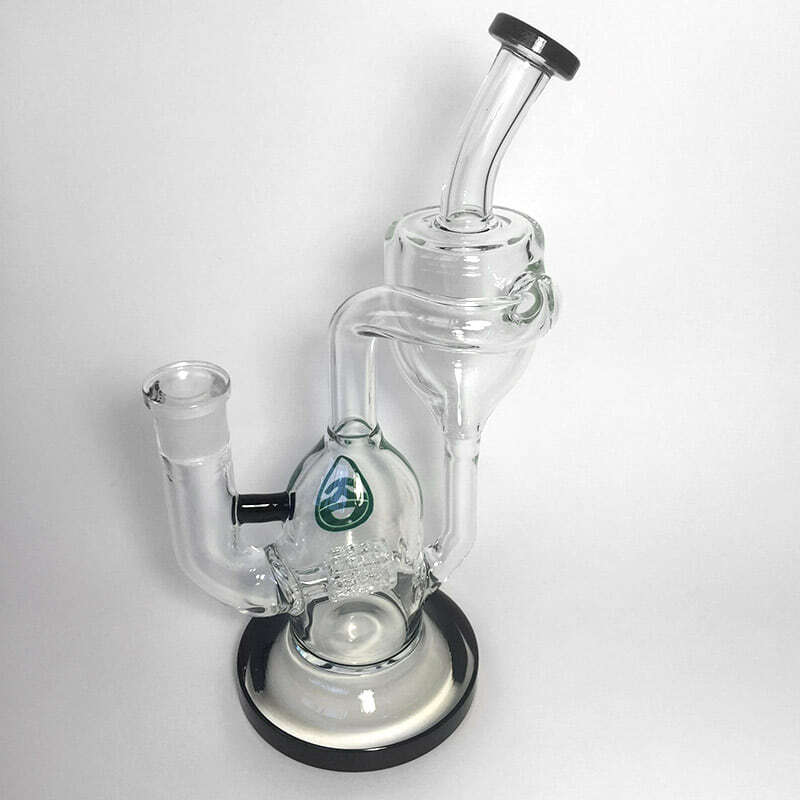 This is the first digital e-nail we’ve tried as well as our first set of recycling glass water pipes so we were really excited to dive in. Each KromeDome e-nail bundle includes two titanium nails that are designed to be compatible with the e-nail heating coil. One of the nails is all titanium while the other nail is titanium and uses replaceable quartz glass dishes that sit at the top of the nail. Good thing the KromeDome e-nail dab rig is simple to use because it did not come with a user manual. 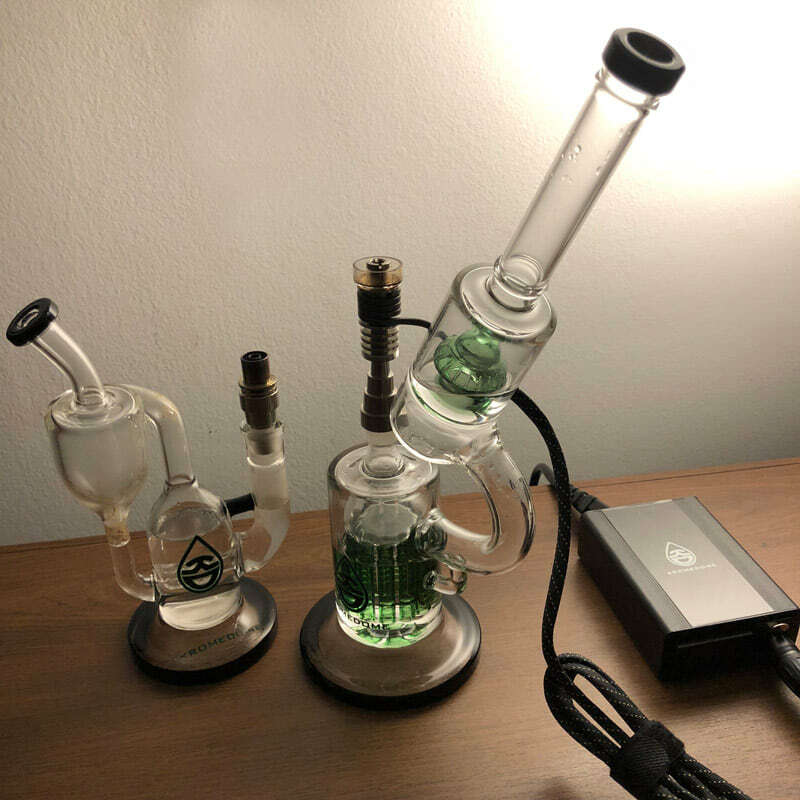 If you’re new to dabbing, this dab rig may seem overwhelming at first. But, it’s actually very easy to setup and use. 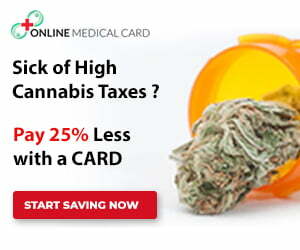 You’ll also find that it’s one of the best cannabis delivery methods. With either water pipe, the instructions are the same. 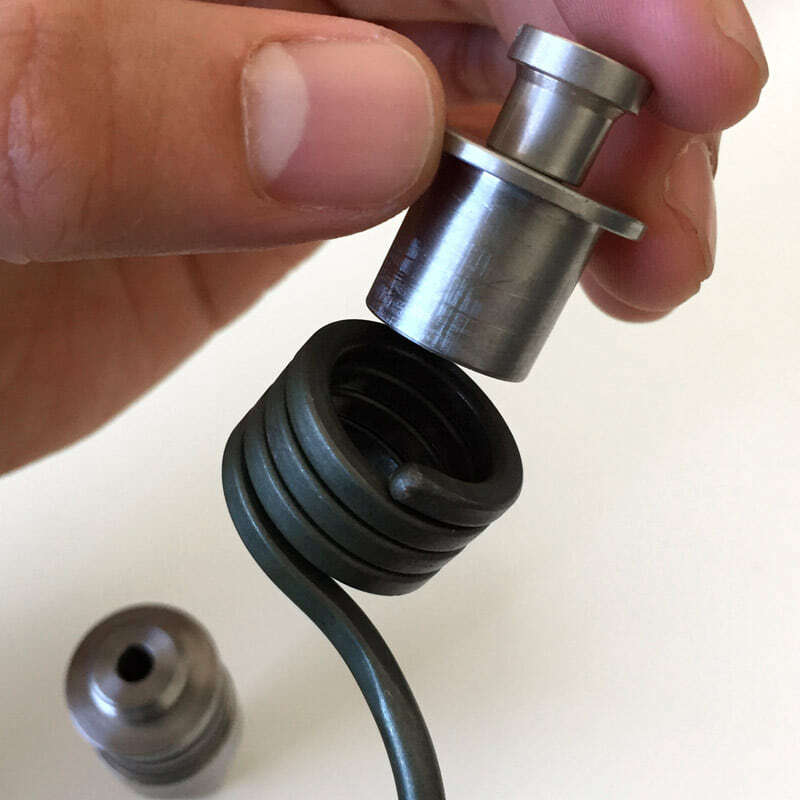 First, fill the water pipe with water, then insert the included KromeDome titanium nail onto the water pipe. The titanium e-Nail coil slides right onto the nail. 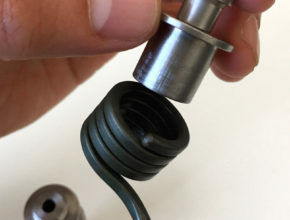 Plug the other end of the e-Nail cable into the KromeDome Lantern (the digital controller). Connect the power cord into the back of the controller and the other end in to an electrical outlet. Once you’re all set, flip the power switch on the back of the controller. Use the up/down buttons to adjust to your desired temperature. Once the desired temperature has been reached, use a dab tool or syringe refill to dispense your cannabis wax, shatter or other cannabis extract onto the hot nail and start to inhale. 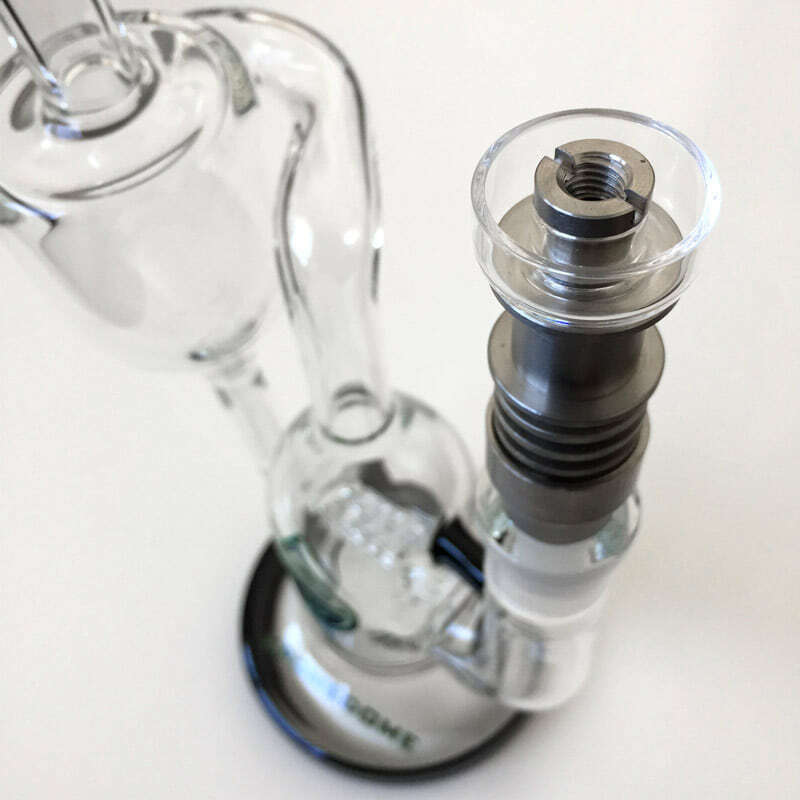 Use a dab tool with a carb cap to get thick, fuller hits. Power off when you’re done. 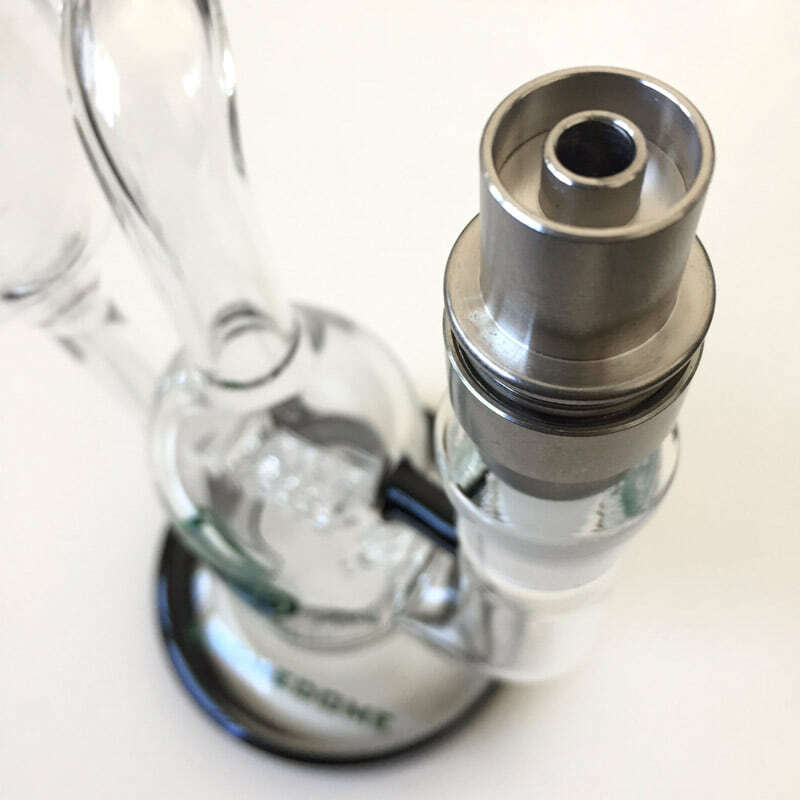 We were beyond thrilled to get our hands on a KromeDome e-nail dab rig setup. 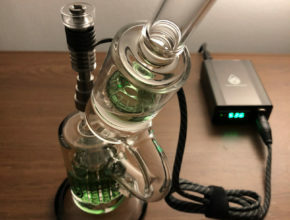 This is our first time testing a legit dab rig setup with a digitally controlled e-nail. 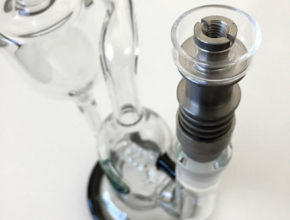 Previously, we reviewed the Dabado Bolt portable e-nail rig which works pretty well, but isn’t as much of a heavy hitter as the KromeDome setup. We were intrigued by both of the glass water pipes we received as they both perform well and look really cool. During the review, we used some wax and rosin extracts from Jetty Extracts, Magic Pipe and Legion of Bloom. Since KromeDome didn’t include a dab tool/carb cap, we used one provided by Clout. 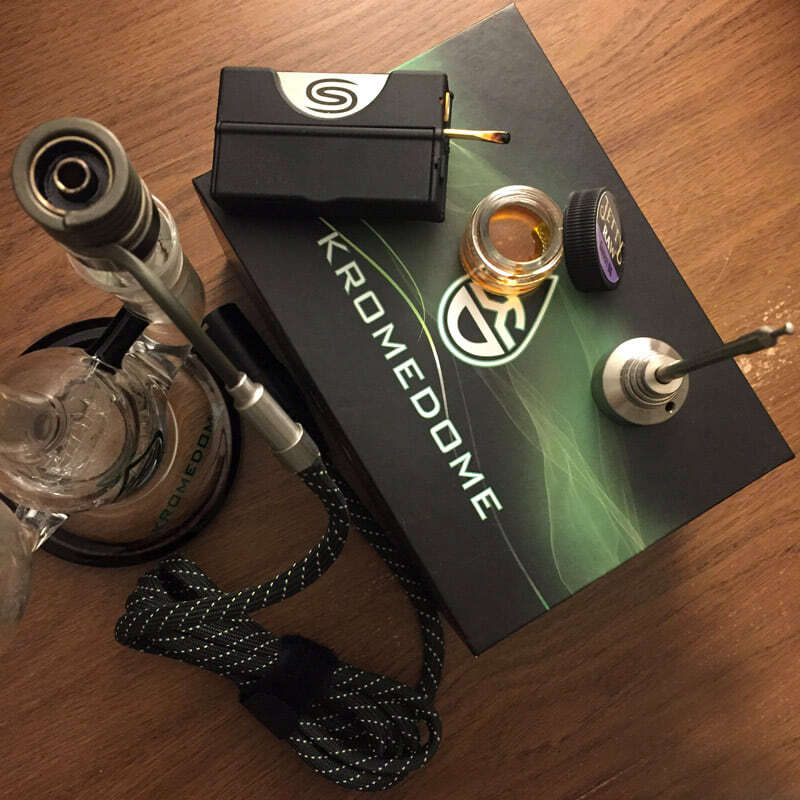 The KromeDome worked well in delivering the hard hitting effects and delicious flavors from these brands. 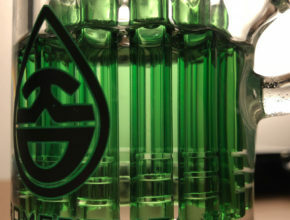 The Cyclone glass water pipe does a great job of cooling down hot vapors. It also creates a cool spectacle as water recycles through its two chambers and creates a tiny, visible water cyclone. 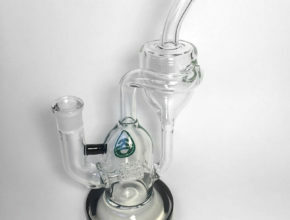 As you inhale, hot vapors are filtered through water in the main chamber. Water and vapor are then pulled into the second chamber where the water and vapor separate. As the bubbles pop, cooled vapors are inhaled as the remaining water recycles back down into the main chamber. Now it’s time to get scientific with the Microscope glass – because, who doesn’t love science!? KromeDome’s Microscope water pipe just looks pretty damn sweet. 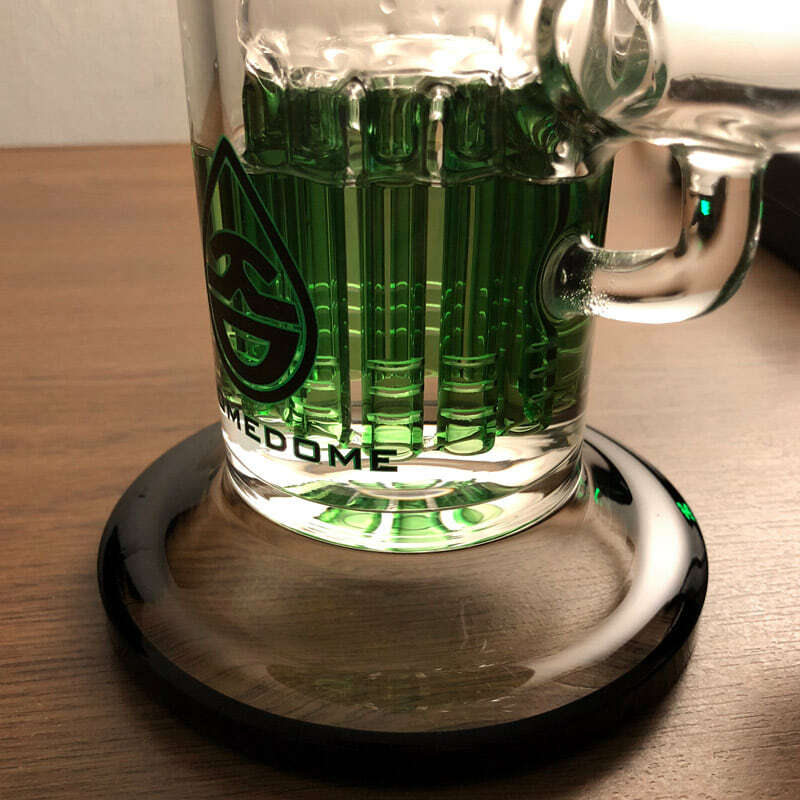 This glass piece is what originally caught our attention and made us curious about KromeDome vapes. 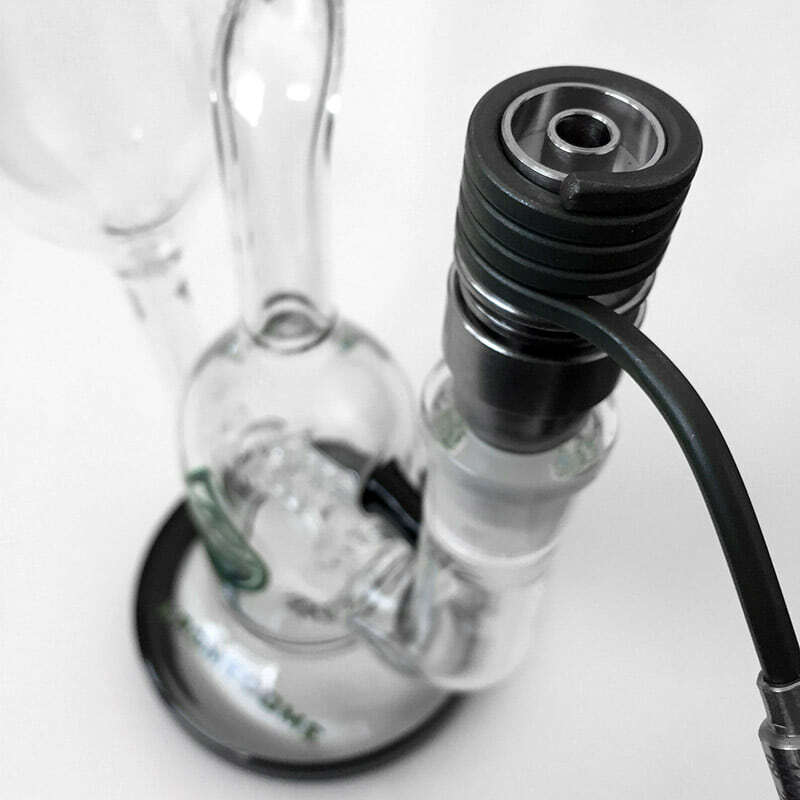 The Microscope is a large water pipe that features excellent diffusion in the main chamber, a longer pathway for vapor to travel and more time to cool down. 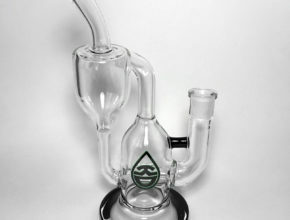 This allows for large, smooth dab hits. 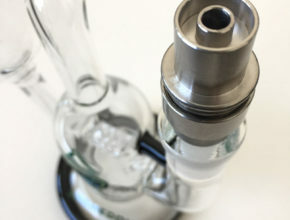 The e-nail is so convenient and easy to use once you get the hang of it. 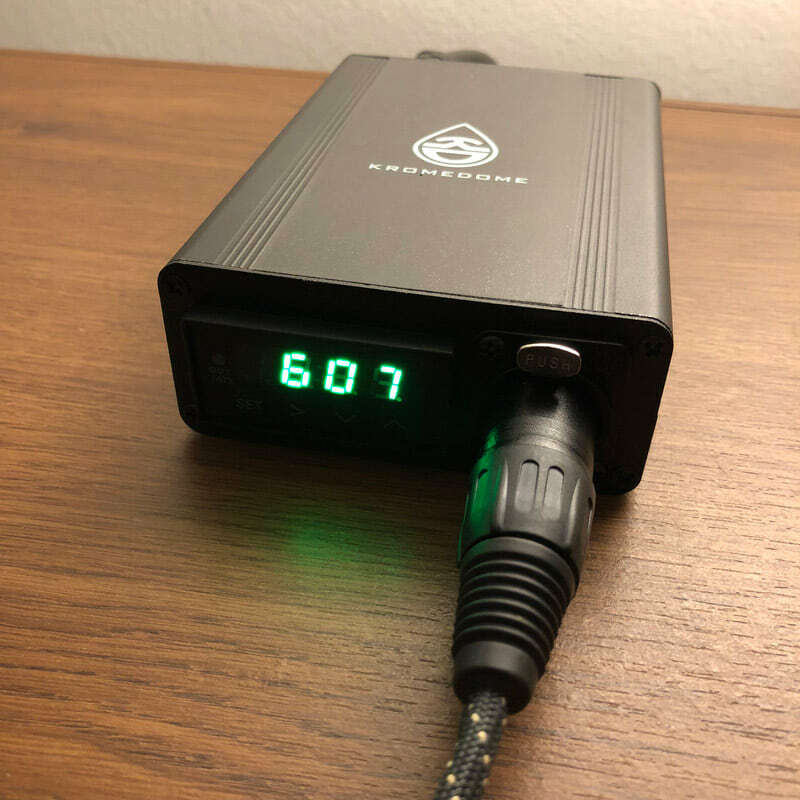 Plug the temperature controller into any electrical outlet which connects to the heating coil. Then wrap the heating coil around the nail on the water pipe. Once you turn on the controller, use its simple interface to set the desired temperature. The coil will instantly heat up and the controller will conveniently remember your chosen temperature. For every consecutive session, just power on the controller and your last temp will be used. 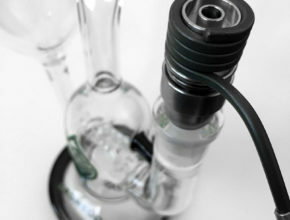 The e-nail coil heats up extremely fast. We found around 600 Fahrenheit to be a great temperature – easy on the lungs and throat while still maximizing vaporization of our cannabis wax extracts. It reaches full temperature in less than a minute and will maintain that temperature until you cut the power off. Word of caution – as the nail is titanium, it retains heat and will stay hot for a long while after you turn off the controller, so just be careful with leaving it out. 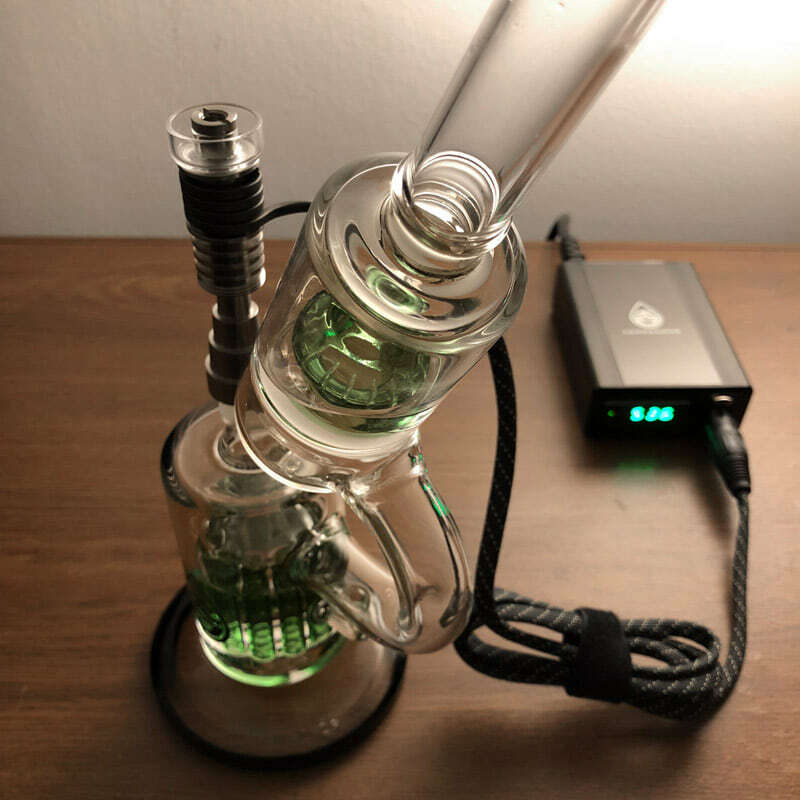 We don’t actually dab too much over here since we have so many different vapes we’re reviewing, but we can honestly say this is a fun one to use and has instantly become one of our favorite vaporizers to use around the house. It’s awesome how you can take one big hit and be off to the moon or just take a small dab of wax and reach that instant chill zone. 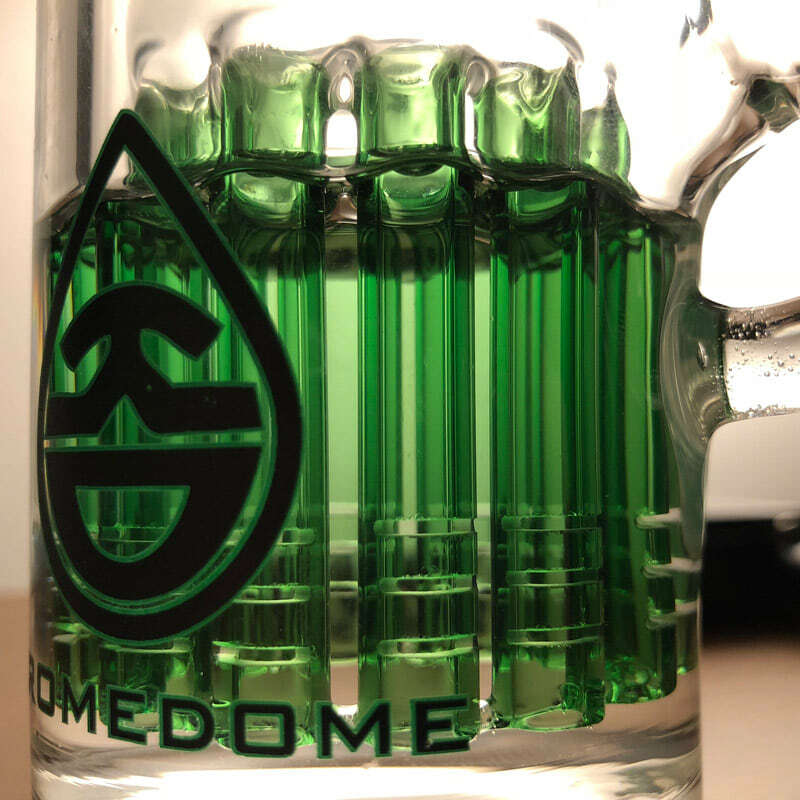 Whether you’re a seasoned dabber or just curious to try it, the KromeDome rig is the way to go. No need for sketchy torches or refueling, and best of all, you will always know your exact temperature. Being able to fine tune your exact dab temperature is great. Once you’ve dialed in your personal preference, you’ll enjoy the perfect balance between low heat and maximum delivery. At low dab temps, you’ll find the heat vapors to be easy on your throat and lungs while at the same time maximizing the transfer of those delicious cannabis terpene flavors and cannabinoids that produce the desired high effect. If you prefer higher temps, turn it up and enjoy those huge rips. With KromeDome’s fair price points, these full dab rig bundles are a steal. There are other e-nail brands on the market (we can’t speak to those brands as this is the only one we’ve tried so far) but we have no complaints here. 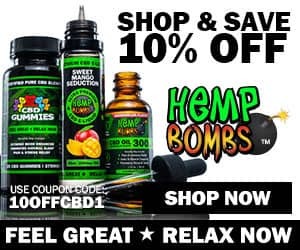 Have a high tolerance or a a favorite concentrate you wish to enjoy? Get the job done right by dabbing with a KromeDome vape! The KromeDome Cyclone & e-Nail bundle is available for $199.99 (was originally $258.99) and the Kromedome E-Nail & Microscope Bundle for $250.00 directly through KromeDome online. KromeDome Lantern e-Nail Kit (the digital controller + the TI coil) is available by itself for $159.99. You may also be interested in portable dab rigs and electronic nails like the Dabado Bolt.